Detail : Paul's fifth solo single. 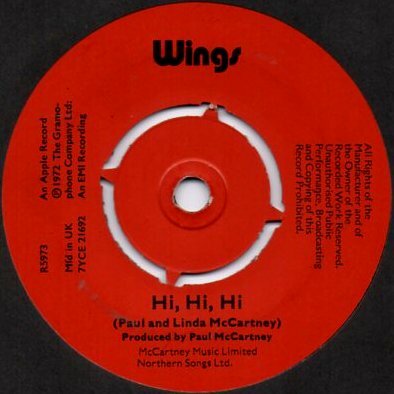 Incredibly, Hi Hi Hi became the second Wings single in the space of a year to be banned by the B.B.C. The reason given was that the lyrics were too suggestive. Radio stations therefore flipped the single and gave their air-time to C Moon. reference to L7 as being a symbol for being "square". So Paul made up C Moon which makes a circle (the opposite). Once again no Apple logo in sight, the label being plain red. Original first pressings have on the label, "An Apple Record (P) 1972 The Gramophone Company Ltd. An EMI Recording." Re-issues in the mid-70's had the publishing credit completely changed with reference to McCartney's MPL Communications Ltd.